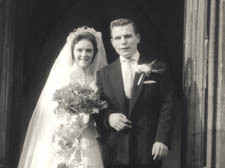 A CAMDEN couple will have their 50th wedding anniversary blessed at Old St Pancras Church in Pancras Road this Sunday. Len Brooks, 71, who was born in the Stanley Buildings in St Pancras and now lives in Medburn Street in Somers Town, asked the New Journal to surprise his wife Janet with a tribute to their long, happy marriage. Unaware of their future together, the bride and groom both attended Argyle Street Primary, and were both born in council estates which have since been threatened with demolition. As a young dressmaker, Mrs Brooks, who was born in the Midhope buildings on the Hillview estate, enchanted the 20-year-old Len when they met on a blind date in 1957. He said: “I was really smitten by her but she took a little longer than me. We started dating and things came along. Eight months later the couple were married at Holy Trinity Church in Clarence Way. Mr and Mrs Brooks have five adult sons who all attended Medburn School, since renamed the South Camden Community School, and trained as plumbers like their father.